As Hillary Clinton and Bernie Sanders battle over who better represents progressive or liberal values, it’s clear that Democratic voters overall have become increasingly comfortable with the “liberal” label. From 2000 to 2015, the share of Democratic and Democratic-leaning registered voters describing their political views as liberal increased by 15 percentage points, from 27% to 42%. 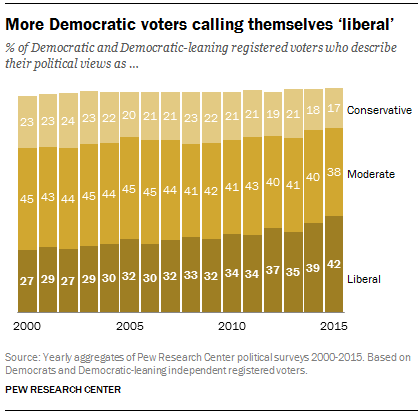 In 2015, more Democratic voters identified as liberals (42%) than as moderates (38%) or conservatives (17%), based on an average of Pew Research Center political surveys conducted last year. In 2008, when Barack Obama defeated Clinton for the party’s nomination, 41% of Democratic voters called themselves moderates, while just 33% said they were liberals and 23% said they were conservatives. And in 2000, moderate Democratic voters outnumbered liberals by 45% to 27%. White Democrats in particular increasingly characterize their political views as liberal, while blacks and Hispanics are far less likely to embrace that description. In 2015, half of white Democratic and Democratic-leaning registered voters called themselves liberals, up 22 percentage points since 2000 (28%). Today, white Democrats are far more likely to describe their political views as liberal (50%) rather than as moderate (36%) or conservative (12%). In 2000, moderates constituted the largest share of white Democratic voters (46%), while just 28% described their views as liberal and 21% as conservative. By contrast, more black and Hispanic Democratic voters characterized their views as moderate than liberal in 2015, and the self-described political views of both groups have remained stable in recent years. Last year, 42% of black Democrats called themselves moderates, 29% said they were conservatives and 27% called themselves liberals. Among Hispanic Democrats, 39% described their political views as moderate, 35% as liberal and 24% as conservative. 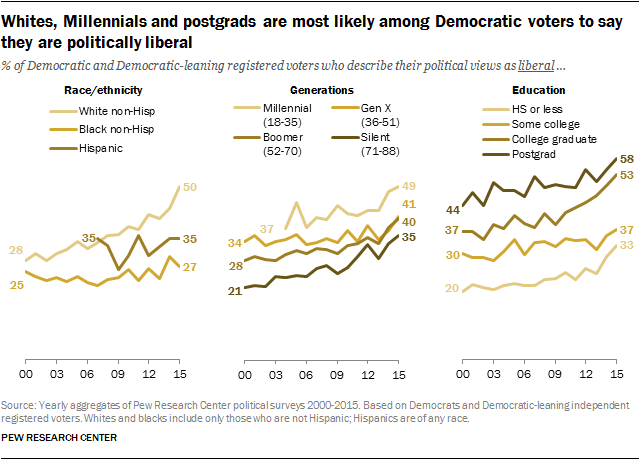 While the share of Democratic voters identifying as liberals has increased across all age cohorts, Millennial Democratic voters continue to be more likely than older generations to call themselves liberals. In 2015, liberals (49%) outnumbered moderates (38%) or conservatives (11%) among Millennial Democratic voters. Among Generation X, Baby Boomer and Silent Generation Democrats, there were about as many self-described liberals as moderates. Democratic voters with higher levels of education are more likely to call themselves liberals than are those with less education. Last year, a majority of Democratic voters with postgraduate experience (58%) described their political views as liberal, up 14 points since 2000. Among Democratic college graduates with no postgraduate experience, 53% described their views as liberal, an increase of 16 points since 2000. Fewer Democratic voters with some college experience but no degree (37%) and those with no college experience (33%) characterized their political views as liberal. It’s important to note that how people describe their views and their actual political attitudes and values are different things, though clearly they are strongly related. While most Americans continue to express at least some mix of liberal and conservative attitudes, the shares who hold both uniformly liberal or conservative values is growing. Rob Suls is a research associate focusing on U.S. politics and policy at Pew Research Center. Jocelyn Kiley is an associate director of research at Pew Research Center.